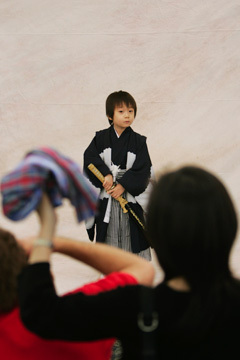 Stefan Yim, 5, remained stoic despite attempts to get him to smile during a photo session for children dressed in traditional Japanese attire. The Japanese Cultural Center of Hawaii welcomed 2006 yesterday with its annual New Year's Ohana Festival in Moiliili, featuring a mix of traditional Japanese New Year's customs, local cuisine and entertainment. 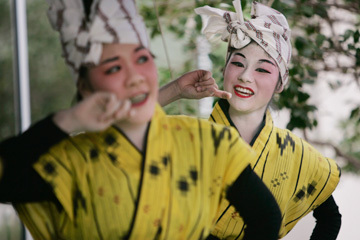 Joanna Nakandakari, left, and Sara Nakatsu of the Nakasone Dance Academy performed the song "Ashibina." 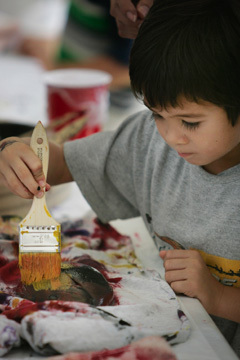 Jared Ohta-Ohashi, 5, tried his hand at making gyotaku -- prints made by painting fish, then pressing them to paper. 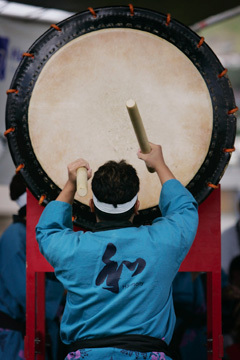 Kevin Laoron hit a large taiko drum while performing with the Shinnyo-En musical group.